Following up on our Unboxing and First Impressions, I have been using the BlackBerry Bold 9780 as my main smartphone for the past few weeks. And you know what that means... I now have a lot to say on the newest Bold from Research In Motion. Most of it is positive, afterall, the Bold 9700 was already an awesome device so one would only expect its successor to be even awesomer. But it's not all positive. Surprising to me, I actually found myself having some mixed feelings towards the BlackBerry 6 experience on the touchscreen-less Bold 9780. There have even been a few times when I wished I could downgrade the 9780 to run on OS 5.0 again (I know it sounds crazy, but I'm just being honest - you'll have to read the full review to find out why). The existence of the BlackBerry Bold 9780 has also created a couple of burning questions for existing and new BlackBerry users out there. I've been getting literally the same two questions via twitter (@crackberrykevin) daily since the device was announced. 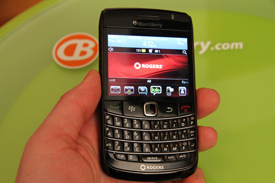 Is it worth upgrading my BlackBerry Bold 9700 to the Bold 9780? Should I get the Torch or the Bold 9780? It's December and the holidays are almost here, so grab yourself an eggnog, kick back and keep reading and I'll answer these questions and unload all the nitty gritty details on the BlackBerry Bold 9780. 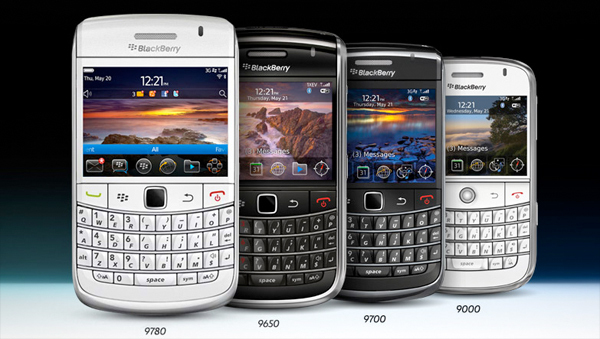 The BlackBerry Bold 9780 is the third Bold on the GSM side of the Bold family tree, following up the original Bold 9000 and newer Bold 9700. 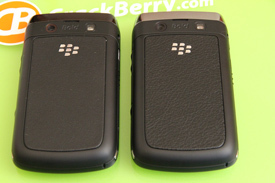 On the CDMA side (Verizon/Sprint), you have the BlackBerry Bold 9650, which was preceeded by the BlackBerry Tour 9630 which essentially was/is a Bold under a different name. When it comes to the BlackBerry Bold 9780, the best way to think of it is as the new model year of the 9700, in a year when not a lot has changed. 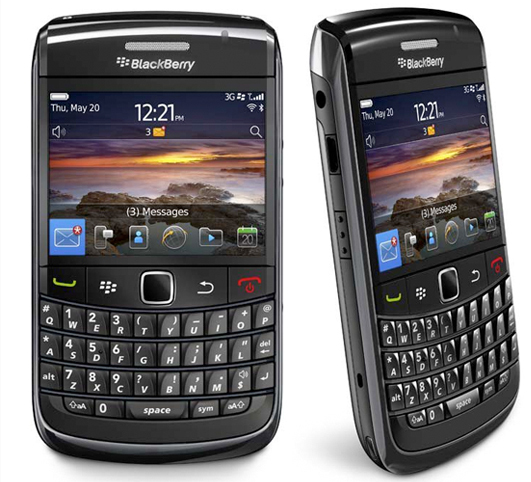 From the 2008 to 2009 model year, big changes were made as the Bold 9000's bigger, blingier design was downsized into the more conservative Bold 9700 form factor. 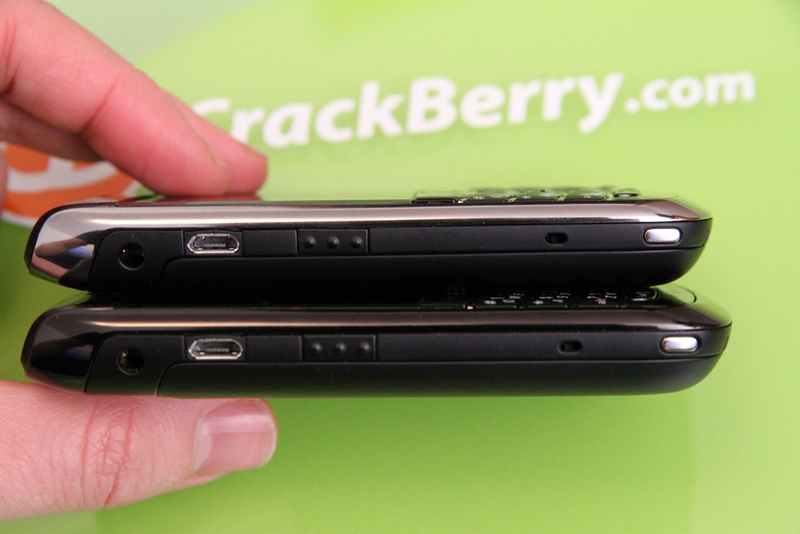 You don't need to be a BlackBerry enthusiast to see the changes between those to models. Going from 2009 to the 2010 model year, the changes from the 9700 to 9780 are much less apparent on the hardware side. Compared to the 9700, the 9780 gets a few internal hardware improvements and a slightly different paint job (on the dark version). Of course, the Bold 9780 does ship with BlackBerry 6 out of the box, while the Bold 9700 still ships with OS 5.0, but with BlackBerry 6 already unofficially available for the Bold 9700 and officially coming soon, this difference becomes moot point. When you take into account Bold 9700 owners can run BlackBerry 6 on their device and that the hardware differences between the 9700 and 9780 are pretty minor, it's no wonder so many Bold 9700 owners, even diehard BlackBerry owners, are wondering if it's worth upgrading to early or holding out for whatever new Bold will follow the 9780. 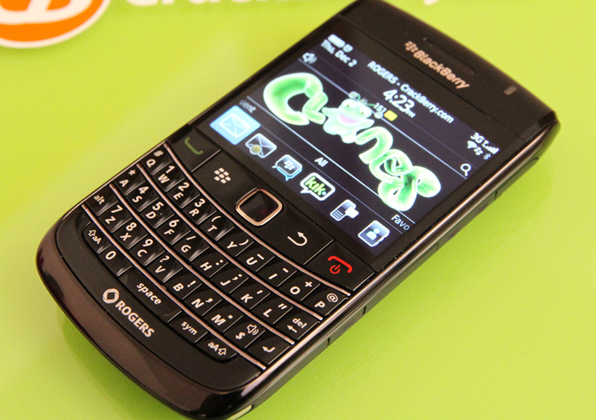 On the CDMA side of the Bold family tree, the decision to upgrade from the Tour 9630 to the Bold 9650 was much easier. With the Tour lacking WiFi altogether, rocking the old trackball vs. the slick new optical trackpad for navigation and not being upgradable to BlackBerry 6, you immediately have three strong reasons to want to jump up to the Bold 9650. That all said, the BlackBerry Bold 9780 is here, it's the latest and greatest smartphone from RIM in the traditional BlackBerry form factor, so let's get to the details. 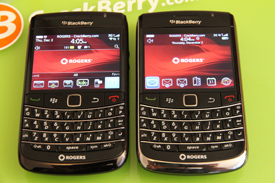 Tech specs aside, the dark version of the Bold 9780 features a slightly different "look" than the Bold 9700. On the Bold 9780, RIM chose to scrap the chrome band around the phone in favor of a blacked-out look (which is definitely hawt!). On the battery door cover, the 9780 features a tighter pattern - it's less of a faux-leather look and more of a car dashboard look. 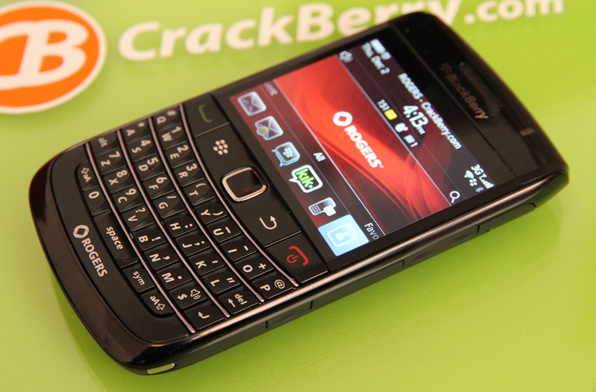 With the Bold 9780 using the same chipset as the Pearl 3G and Torch 9800, it also lacks Open GL support for 3D graphics. I was sad when the Bold 9700 didn't support Open GL, and am even more sad to see that a year later the next GSM Bold doesn't either. If you're not sure what that means for the graphics experience, check out this video review comparing Need for Speed on the Bold 9700 vs. Storm2. It'll be the same story for the Bold 9780. 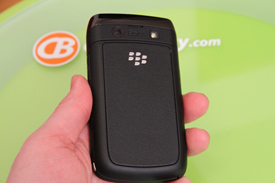 I really hope that the next GSM BlackBerry we see supports Open GL. As for what carriers will get the BlackBerry Bold 9780, you can expect it to roll out everywhere the BlackBerry Bold 9700 is offered. 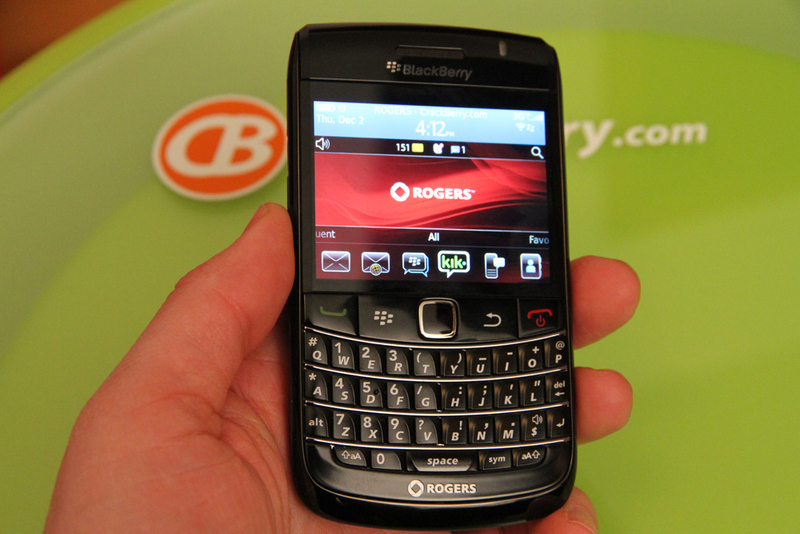 The unit in this review is from Rogers in Canada, and you can already find the 9780 on T-Mobile in the USA. Expect it to hit AT&T (hopefully) soon too. When it comes to hardware impressions, for the most part I could copy and paste what I wrote in my Bold 9700 review into my Bold 9780 review. And that's not a bad thing, as on the whole the BlackBerry Bold 9780 is one sweet piece of hardware. The Bold family is RIM's flagship line of devices in the traditional front-facing full-qwerty design that is synonymous with BlackBerry (Curve is the entry-level line). The original Bold 9000 was a fairly big device, with an extra 1/4" of width in the display and keyboard as compared to the 9700 and 9780. I still personally think the 9000's keyboard is the best there has even been on a BlackBerry, but there is no denying that the Bold 9780's smaller size hits the sweet spot of pocketability and ease of typing/use. It feels great in the hand, has a very easy to type on keyboard, and is small enough to carry in a pocket. Build quality of the 9780 seems to be equally good to the 9700, and arguably appears to be even better. Though the phone is very light in weight, it doesn't feel cheap, and the blacked out look gives off an aura of understated luxury. I've always been a big fan of Swiss mechanical watches, and the blacked-out look has really caught on there in the past few years - the 9780 definitely pairs nicely with a blacked-out watch. Although the build quality does seem solid, unfortunately I was unlucky with the Bold 9780 that I picked up from Rogers in that it had a defective trackpad. At first I thought it was a software glitch as my symptom was that the cursor often wanted to scroll up by itself (which is super annoying and had me wanting to throw the phone through a window), but after a week of futzing around with it determined it was definitely hardware (I could never reproduce the glitch if I covered the trackpad entirely with my thumb, preventing any light from hitting it). Luckily the return process was easy and my second 9780 is performing all good so far. Over the years I've been pretty lucky with my BlackBerry Smartphones in terms of reliability -- rarely even having to clean or replace a trackball -- but in the past 3 months had a Torch completely die on me for no reason and now a faulty 9780 trackpad. RIM has manufacturing facilities around the world (Canada, Hungary, Mexico) and in the 25+ BBs I've used since getting my first 7290, so far the only devices I've ever run into hardware issues with have been made in Mexico. I'm not sure if it's coincidence or a QA issue or what, but I'm nearly to a point where I'm going to check that my next BlackBerry is a made in Hungary or Canada unit before I take it home from the store. Looking around the perimeter and controls of the 9780, things are identical to the 9700. The top of the phone has hidden lock and mute buttons. I still love the way RIM discretely implemented these buttons, though on more than one occassion have run into BlackBerry owners who had their 9700 for months and didn't realize they were buttons - maybe they're a little too discrete! The left side of the phone makes room for the 3.5mm headset port, the microUSB charge/sync port and a left side convenience key. I love the left side convenience key - it still pains me that this is missing from the Torch, so I hope we see the left side convenience key return on future device models. The right side of the phone features the volume up/down keys and right side convenience keys. In case you're new to BlackBerry and not familiar with the concept of convenience keys, they are essentially application shortcuts tied to a button. By default they typically launch Voice Dialing (left) and the camera (right), but I typically change the left one up to either launch QuickLaunch or a Twitter client. Like the 9700, the battery door on my 9780 was TOUGH to remove initially. It breaks in fairly quickly and becomes much easier to remove (but not too easy! ), but I swear, the first time I had to remove the battery door I felt like I was going to break the phone. This really tripped me up when I first got my 9700 (see video below for how to remove it properly), but even on my 9780 and KNOWING how to remove the battery door it still was wayyy too tough. This is a pretty normal occurrence with a lot of the 9700 and now 9780 owners I've spoken too - it doesn't make for a very positive out-of-the-box experience so I'd love to see RIM smooth it out a bit. All in all, when it comes to appearance, form factor and build quality, talking about the 9780 is the same as talking about the 9700. The BlackBerry Bold 9780 features the same non-touchscreen 480x360 pixel high resolution display that's found on the Bold 9700, Bold 9650, Tour and Curve 8900. Overall it's a solid display and is much nicer than the 320x240 display found in the Curve 3G or Curve 8530/20. If you're trying to decide between purchasing a new Curve or new Bold, the higher resolution display is definitely one of the reasons I would go with the Bold. The colors are much sharper and brighter and smooth, and in the web browser the extra pixels make a big difference. That said, like a lot of other BlackBerry users out there, I'm anxiously waiting for the day when RIM puts a touchscreen into this form factor of device. A lot of new BlackBerry users first make the mistake of trying to tap the icons on the screen, but especially with BlackBerry 6 (more on this later) I've even noticed myself wanting to reach out and touch the screen. With OS 5 I've never really found this to be an issue. Maybe it's the fact I've used BlackBerry 6 on the Torch a lot with a touchscreen so it's habitual, or maybe there is just something about BlackBerry 6 that is more compelling for touch, but either way, I want my next front-facing keyboard BlackBerry to also have a touchscreen. It would have been nice for the Bold 9780 to be the Bold that introduced this, but it's looking like we'll have to wait for the next Bold to get this. While on the topic of what I'd like to see in the next Bold, I'm also hoping they find a way to up both the resolution and the phsyical size of the display. When people didn't use the browser on their BlackBerry (because it was painfully slow to use), and before apps became the thing, the smaller physical size of the display wasn't really a concern - using that frontal real estate for a solid keyboard was more important. Now that BlackBerry has a good web browser and you're using the phone for so much more than emailing, texting and BBMing, the bigger the screen, the better (assuming your battery can still manage to last through the day - big displays tend to eat battery life). I'm sure RIM realizes this too, so will be curious to see how they address this on the next Bold. The Bold 9780 uses the same chipset and processor that's found in the Torch 9800, which is clocked at the same 624MHz processor that the Bold 9700 and 9000 were clocked at. Though software updates have greatly improved the performance of BlackBerry 6 on the Torch since its somewhat laggy debut, the same processor on the Bold 9780 seems to be even snappier at powering the OS right of the box. Maybe the lack of touchscreen contributes to the speed. As usual I'm sure things will get even smoother with software updates (the Rogers unit in this review shipped with OS 6.00.285, but at the time of this writing we've already seen OS 6.0.0.359 leak for the 9780). 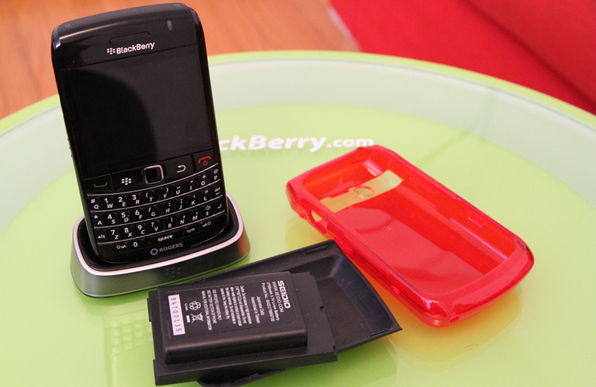 The BlackBerry Bold 9780 doubles up the internal flash memory from the 256MB found in the 9700 to the now-standard 512MB found in devices like the Bold 9650, Torch and Style. This memory is where the operating system resides, where apps are installed and where things like browser cache and your email inbox eat up space. More memory doesn't really equal faster speeds, but running low on memory guarantees things will slow down. So compared to the 9700, on the 9780 you can load up more apps and do more on your device before you ever run out of room. Conversely, if you keep things on your Bold 9700 fairly "clean" you should find that BlackBerry 6 will run on it pretty smooth as well. 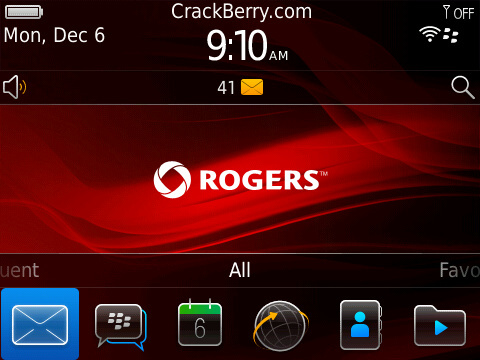 Out of the box, my Rogers BlackBerry Bold 9780 had ~271MB of free space on it. In terms of additional storage for media and photos, the Bold 9780 comes with a 2GB microSD card, which can easily be swapped out for other cards. It'll take a 32GB card all good. 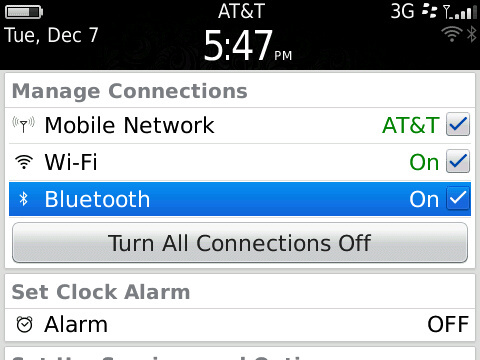 Like the Bold 9700, THE BATTERY LIFE ON THE BLACKBERRY BOLD 9780 IS FRICK'N AMAZING! Of course, I do find myself doing a lot more web browsing on BlackBerry 6 than I did on OS 5, which eats into the battery a bit more, but all in all it's really solid. There's something really satisfying about going to bed at night seeing the battery level indicator still above (on lower-usage days way above) half full. This one often seems to vary a bit by carrier, but at least on Rogers for me the call quality of the 9780 seems hunky-dory (it's a word for real, look it up). The BlackBerry Bold 9780 features the same 5.0 megapixel camera that is in the BlackBerry Torch, and I've found it's performance to be the same for me (photography is a skill I need to work on, so any pros in the audience can weigh in if they discover any differences). I went pretty in-depth on the new camera in my Torch review, so if you want further details here click on the link below to jump over to that section. Everything else on the hardware side is what you'd expect. On the WiFi front, the most noticeable difference to speed for the "average" consumer comes from the fact that the BlackBerry 6 web browser now automatically uses WiFi when available vs. on older operating systems in which you manually had to switch to the HotSpot browser. Unfortunately, the BlackBerry Bold 9780 only has WiFi b/g (no N support), which is really stupid to me considering both the Pearl 3G and Torch 9800 do have WiFi N. Doing some digging, the word is that the Bold 9780 is so closely based on the 9700 that upgrading to n was not easily done on existing architecture. So I guess if it's too hard to do you, you just skip it and wait till you're making a more major change to a device rather than an incremental one. GPS and Bluetooth are there working as they should, and the speakers seem to be on par with the 9700. I noticed a few threads kicking around the CrackBerry forums where members mentioned they thought the speaker/speakerphone was better on the 9780, but I'm not certain of that. I'm not aware of any changes here... but could be wrong - maybe some tinkering was done. For BlackBerry Bold 9700 owners who want to upgrade to the Bold 9780, the good news is that your BlackBerry Bold 9700's accessories will work just fine. Cases will fit, batteries will fit, and your charging pod will fit. It also means there is a large selection of accessories available at launch. Shamless plug time... Be sure to check out ShopCrackBerry.com for all your BlackBerry Bold 9780 accessory needs. We just rolled out free shipping on orders of $50 or more in the continental US, so you can't go wrong! All in all, the BlackBerry Bold 9780 hardware is as good or better than that of the Bold 9700, which by definition makes it a pretty awesome device. You can't argue with more memory and more megapixels, and I like the blacked-out look. Though you know the moment it hits Rogers or AT&T in white, I'll be picking that one up! If you're looking to learn about everything that's new in BlackBerry 6, be sure to check out our super in-depth BlackBerry 6 Review. For this review I want to focus more on BlackBerry 6 as it pertains to the user experience of being on a non-touchscreen device with a smaller display and with a front-facing keyboard. 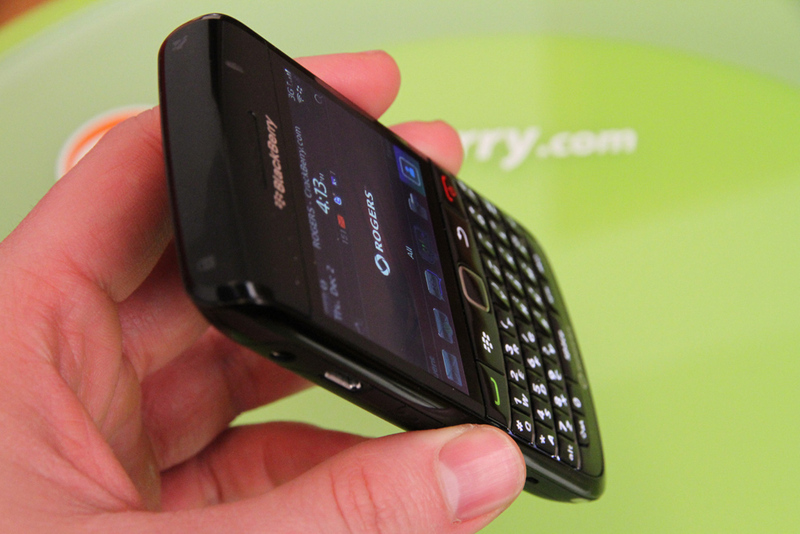 Seriously, if you want the in-depth details on BB6, check out our BlackBerry 6 Review. First Time Smartphone/BlackBerry Owners and users who fit into the category of the consumer market are going to like the BlackBerry 6 experience a lot more than they would OS 5.0. Out of the box, the tutorial videos and new setup wizard get you up to speed more quickly, and the whole look and feel of the operating system is more modern and sleek than any BlackBerry of the past. The homescreeen views (All, Favorites, Media, Downloads, Frequent) expose more of your BlackBerry's capabilities to you, which get you using the device for more things than you normally would otherwise (yes you can use your BlackBerry as an MP3 player and watch movies on it!). The web browsing experience in BlackBerry 6 is much better than in the past too - so while the screen is on the small side compared to some of the smartphones hitting the market these days, you will be able to browse your favorite websites. And with a full keyboard right there all the time, you'll be pounding out BBMs, emails, texts, tweets and facebook updates like crazy. Long Time OS 5/4.x BlackBerry Users, heavy communicators and those who fit into category of enterprise user are also going to like BlackBerry 6 more than OS 5, but there's going to be a bit of a re-learning curve and are a couple of annoying things that'll drive you bonkers that you'll have to get used to (which hopefully RIM will address soon). Let's start with the annoying part - the homescreen views. On a touchscreen, you normally open apps from the homescreen by by tapping on the icons, so accidentally scrolling between views is not an issue. However, with BlackBerry 6 on a non-touchscreen device, you have to scroll to the icon you want then press in on the trackpad. On the 9780, I constantly find myself accidentally scrolling between views while attempting to open specific applications (note, this can happen on the 9700/9650/etc. on BB6 too, so it's not a 9780 specific thing). Namely, my main messages app is always the first icon on the screen, so when I scroll quickly to it, I end up overshooting and change to the next view. Over the course of an average day, I've been finding myself accidentally scrolling to the next screen anywhere from 15 to 30+ times a day. Hitting the red end key does at least bring you back to the All view quickly when you get out of place, but I shouldn't be having to hit that all the time due to acciental scrolling. I'm not alone on this one either. It actually makes me kind of mad that RIM released BlackBerry 6 without having the ability to go back to a simpler homescreen experience, either via an option to disable homescreen views or by providing an alternative theme that does not have the views built in. 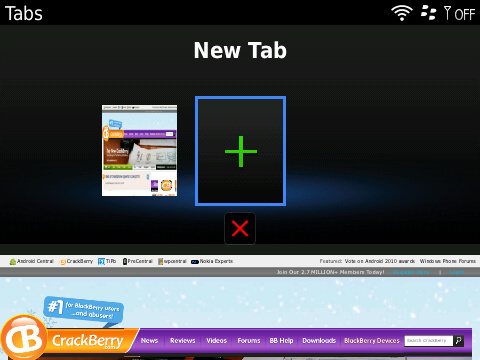 Hopefully BlackBerry 6.1 will have this built in (to me this is HIGH PRIORITY! It got so annoying one day that it nearly made me want to go back to my 9700). In the meantime, theme developers will be able to address this once Theme Builder 6 gets updated and officially released - I'm sure we'll see the next #1 theme in the CrackBerry App Store will be a replica native theme that lacks the views). The other annoying homescreen change that is difficult for me to get used to is that it now requires two taps of the menu key (the one left of the trackpad) to open the full icon tray. On the teaser view (where you only see six icons at the bottom), I really think clicking that button once should open the "tray." Once the tray is fully open, then tapping the menu key again should pop up the menu options (Add Folder, Hide, Mark as Favorite, etc.). This also bugged me on the Torch, but I guess with the touchscreen use I found it to be less of an issue. On a non-touchscreen, it drives me bonkers. [ Update: So it turns out you can also evoke the full tray by scrolling down a long scroll down on the trackpad. It works, and really fixes this issue for me. It's not exactly intuitive though for discovery - seriously, I never stumbled upon this in literally weeks of use. Makes me feel like a rookie! ] These two gripes are likely of no-concern for 99% of the folks out there reading this, but for me there my two biggest issues with the BlackBerry 6 user experience on a non-touchscreen device. And for people who use their phone mainly as a communication tool and for one or two key apps, these little issues really do slow you down. The basic homescreen user experience feels less efficient. These two issues aside, power communicators and enterprise users will hugely appreciate universal search and the new web browser. 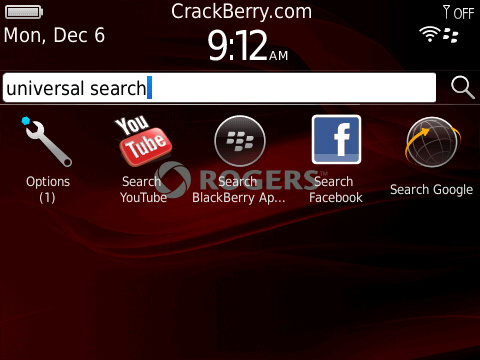 Getting familiar with universal search saves a lot of time, and for a lot of people having a BlackBerry web browser that's now quicker and renders more accurately means they can now leave there laptop at home when they travel. Another homescreen improvement is the shortcut at the top for Managing Connections that saves time on toggling the Radio, WiFi and Bluetooth on and off. BlackBerry 6 also adds the homescreen message notification preview, which I've now determined to be a bit handy and a bit useless at the same time. I wish it could be customized more. I really like being able to preview my upcoming calendar appointments from the preview, but I find for messages themselves I don't really use it - if I have emails or tweets or anything else, I'm pretty much heading straight for the app as soon as my LED light blinks. In a smartphone market where having a big touchscreen is all the rage, one of the key reasons a person buys a smartphone in this form factor in 2010 is because they are heavy communicators - they want that keyboard to be there all the time for quick, accurate typing (they don't even want to wait the 1/10th of a second it takes to slide out a keyboard a la the Torch nevermind typing on glass!) and they're willing to sacrifice the screen real estate to have that keyboard. The user experience here is focused around speed. And historically, that's what the BlackBerry experience has always been about. I remember David Yach, RIM's CTO of Software, at the first BlackBerry Developer Conference on stage talking about RIM's philosophy and the red light test - you should be able to pick up your smartphone and accomplish anything you want to do in the time you would spend waiting at a red light. He also put it another way... the BlackBerry experience is all about adding an hour to your day by giving you the ability to turn all of those one minute chunks of time we all waste into productive time. With that philosophy in mind and ignoring my couple of gripes which slow things down a bit, BlackBerry 6 does a solid job of adhering to that traditional BlackBerry experience while expanding the use of the phone beyond the basics. 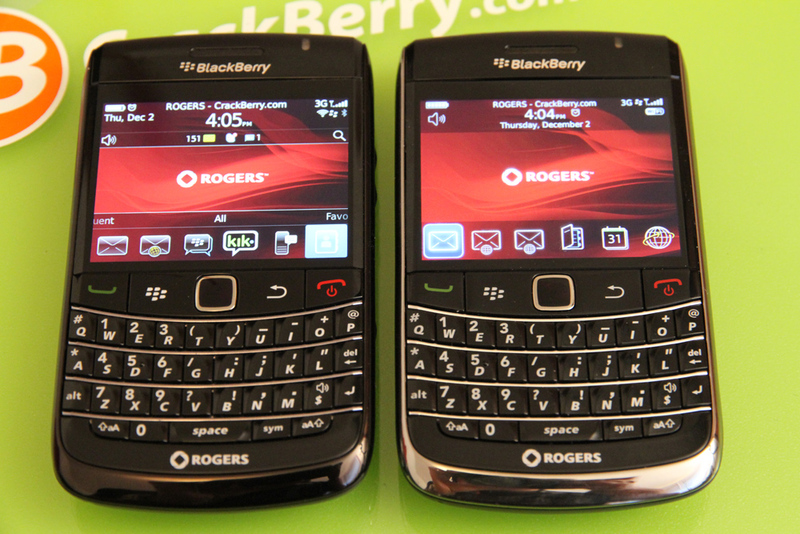 Is it worth upgrading my BlackBerry Bold 9700 to the Bold 9780? I also find it interesting that carriers like T-Mobile and Rogers are not even listing the Bold 9700 for sale on their sites anymore. I think the reason for this is pretty clear - if they offered the 9780 and 9700, the price of the 9700 would have to be driven down since it's a year older, and at the lower price point is where they want to offer devices like the Curve 3G or 85xx where they have higher margins. The price of the 9700 would have to drop by quite a bit from a consumer standpoint being it's a year old, so it would be hard to justify the 9780's higher price (that camera and RAM can't cost that much), plus with the body/case design not really changing at all it makes much more sense to just transition straight to the 9780. So new customers won't even have the option to buy a 9700 or 9780 - for the most part they'll be going right into the 9780. Should I get the BlackBerry Torch 9800 or the BlackBerry Bold 9780? This one all comes down to priorities. If you're on a carrier where the Torch isn't offered (ie. T-Mobile USA), the Bold 9780 is obviously the winner. If you're on AT&T or Rogers or a carrier which carries both, then the decision becomes a matter of preference. 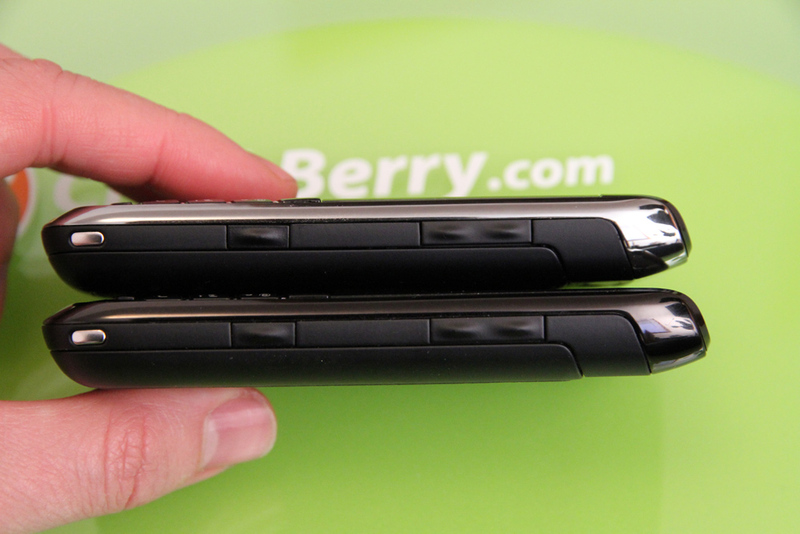 Key Reasons why I'd pick a Bold 9780 over the Torch: The Bold 9780 feels better in the hand, is lighter and more pocketable. The keyboard is also a bit nicer to type on. The Bold 9780's battery life is way better (it's a bigger battery than in the Torch, and the 9780's smaller screen size helps save the battery juice). I also prefer having the keyboard right there and not having to slide the phone open to get to it. It's more efficient. Key Reasons why I'd pick a Torch 9800 over the Bold 9780: The bigger touchscreen makes everything in the BlackBerry 6 environment better. Navigating the OS by tapping is nice, web browsing with a touchscreen vs. trackpad is much nicer too. Once you get used to a big screen smartphone, going back to a smaller screen is TOUGH. Still has a keyboard, which while not quite as nice to use as the 9780's, is still pretty solid. What if it's my first BlackBerry? Good question. And a tricky one. Buying a phone always starts with picking your carrier (you need coverage where you work, play, live). Assuming you're on a carrier where the Bold 9780 and Torch are offered, it again comes down to your priorities. Getting a BlackBerry with a always-present keyboard (Bold 9780, Curve 3G) means you have the best communication tool on the planet (go for the Bold 9780 if the budget allows). 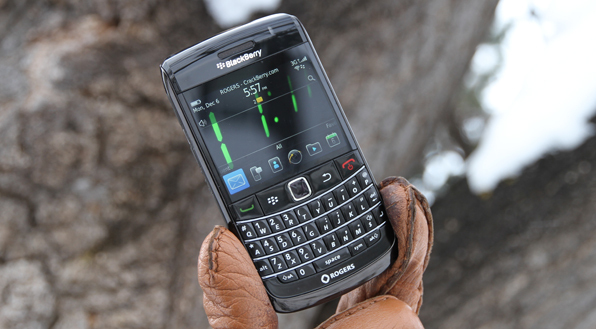 While the Torch isn't quite as efficient as a communication tool, if you haven't had a BlackBerry before you won't know what you're missing in that respect - so going Torch is probably the best option. Having a bigger screen and a touchscreen really adds to the experience. You might just want to grab a spare battery for if you get low on juice at the end of the day from heavy device usage. @crackberrykevin the fact that you couldn't fit your entire review into a tweet is surprising. "9700+512MB+5MP camera=9780" Done. And yep, Andrew was right - you literally can sum up the 9780 in 140 characters or less. It's too bad that RIM didn't put more into this revision to make it a really exciting one to talk about, but the good news is the 9700 was an awesome device so any improvement to an already solid device is a good thing. I know I harped on a few things in this review, but at the end of the day the BlackBerry Bold 9780 is an awesome BlackBerry. 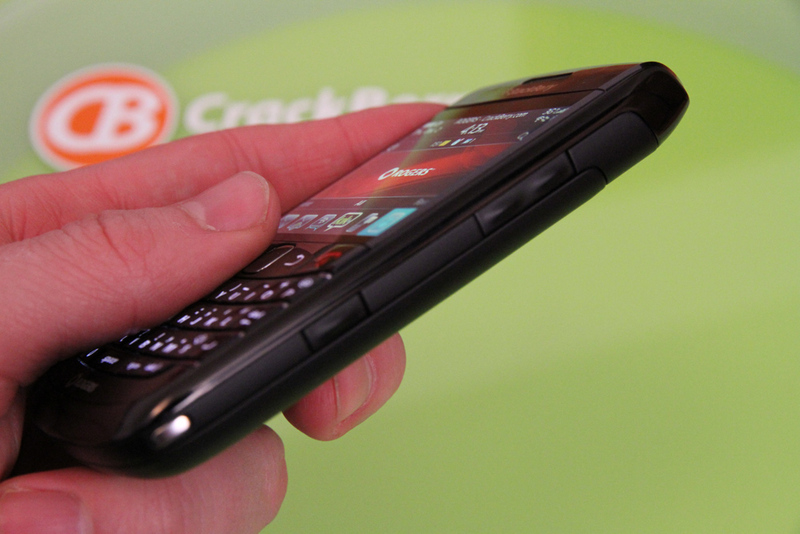 But you know it wouldn't be a CrackBerry review unless I gave you all the back story and way too much info. Hope you enjoyed it! 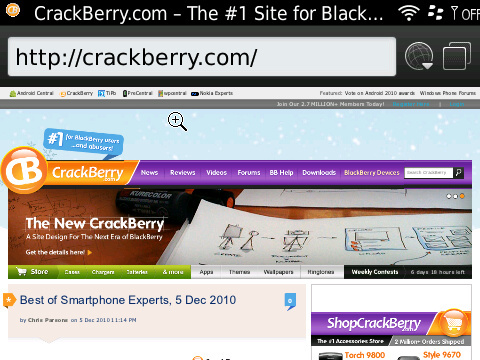 BlackBerry 6 - yay for webkit browser and universal search! The BlackBerry Bold 9780 improves upon the already-awesome BlackBerry Bold 9700 by adding more memory, a better camera, and the new BlackBerry 6 operating system right out of the box. BlackBerry 6 brings with it a lot of improvements and new features, including a faster web browsing experience, but also makes you wish the 9780 featured a touchscreen - BB6 wants to be touched!